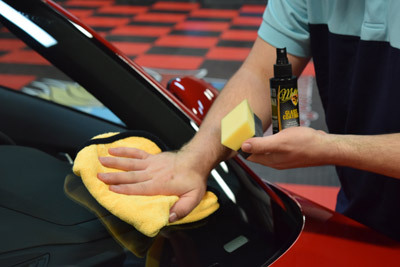 Nobody likes cleaning glass and neither do we, which is why we’ve come out with McKee's 37 Glass Coating – a super hydrophobic coating that repels airborne contaminants, water, rain, dirt and oil, keeping your windshield cleaner in between regular washes. If you’re as particular about your glass as we are (Bob especially!) then McKee's 37 Glass Coating is for you. This super hydrophobic coating was developed and tested in South Florida, one of the most rainfall ridden parts of the country. 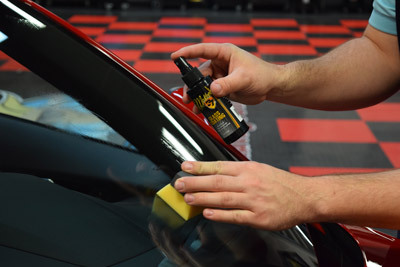 Trust us when we say that McKee's 37 Glass Coating is one of the best investments you can make in car care! McKee's 37 Glass Coating goes on crystal clear and stays that way – no excessive rubbing or buffing required. Application is as simple as spraying the coating directly onto the surface and evenly distributing it with a foam applicator. That’s it! The coating self-levels so there is no heavy rubbing or buffing required. A single application of McKee's 37Glass Coating will last up to one year! McKee's 37 Glass Coating is comprised of nano-glass ceramic particles that fill in the microscopic pits, pores and craters on your vehicle’s glass, making the surface perfectly smooth. This prevents dirt, water, oil, snow, sleet and rain from adhering to the glass, keeping it clean while optimizing visibility. McKee's 37 Glass Coating creates such an immense amount of surface tension that water will bead up and roll off at speeds above 30 mph, rendering your windshield wipers virtually unnecessary! 1. Ensure surface is cool to the touch and out of direct sunlight. 3. 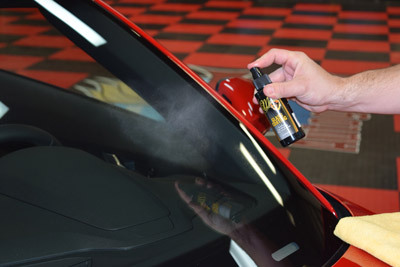 Spray McKee's 37 Glass Coating directly onto the surface and evenly distribute using a foam applicator. 4. Allow product to set up for 2 minutes then lightly buff with a clean, soft, lint-free microfiber towel. Do not apply any pressure to the towel while performing this step. It makes the water bubble up on the windshield and blow off while driving. Plus frost scrapes off easier. I really like the idea of a quick glass sealant that lasts up to a year, but man is it super streaky. It drys way too fast so itâ€™s very difficult to remove every streak. It does work, but I will not buy again. If you are reading this I would highly recommend trying Carbon Collective Platinum Glass instead. Used it on more than a handful of cars and itâ€™s great. This coating is fair but I guess I was expecting too much after reading the reviews and comments. I guess I will see how it holds up but honestly I don't think it is any better than rain-x. Glass is very hydrophobic after using this product. Make sure you use the McKee's coating prep polish other wise the coating wont bond properly this happened to me but Autogeek helped solve my issue. I love the Klasse system but I went from a black Audi ( hard paint) to a Jet Black BMW ( super duper soft paint) and could not get the Klasse sealant on without streaks no matter how I tried so thought I'd try a simple paint coating that may match the Klasse in durability and shine. My car is 6 months old and has several streaky coats of glaze on it which I wanted removed. I used Meg "ultimate compound"on the hood and then the entire car with the Mc Kees pre- coating polish using a DAP to try and get it off. That stuff, in layers, is tough as nails!! But, the polish remover did get it off after several passes. Anyway that was a six hour process. But after that I used the coating and it went on well. My desire is to have the equivalent of Klasse but something that would perhaps harden my soft paint. It didn't streak so I'm happy about that and seems to have a glassy sheen which I enjoy. Unlike a previous poster, I was able to put multiple coatings when done within hours of the first. Perhaps I did something wrong???? I followed directions and cross hatched each section twice. Well will see. I will post later to see if it truly does last "two years". But the glossy sheen is what I'm looking for. I will occasionally use Sonis spray glaze over to extend the life of the coating. "High spots" or excess product, came off easily with a mf wipe and the a mc buff. Such a blessing with the soft paint that marrs with a microfiber!! ProsAfter the prep, goes on easy!! ConsDon't think it will last as long as more difficult to apply products. But it didn't streak!!! !